The ruins of St Mary’s Church stand on a low rise nearly a kilometre north east of the village of Colston Bassett. It was built on the site of an older church, probably Saxon. (A Saxon stone has been found nearby.) It was definitely in existence by 1135. The oldest visible part, according to Pevsner, is the walled-up Norman north arcade with circular piers but pointed arches. The south arcade was partly transitional, partly 14th century. Also of the 14th century are the chancel and tower arch, although the tower is 15th century with the typical frieze of this neighbourhood. Pevsner thought the south transept must have had ’a sumptuous window’ but it is now all gone. In the mid-18th century classical windows were inserted. Much of the building is of blocks of blue bias limestone in thin layers. Several different stones, eg white limestone and ironstone, were used for dressing and facing. There are a number of good slate headstones in the churchyard. 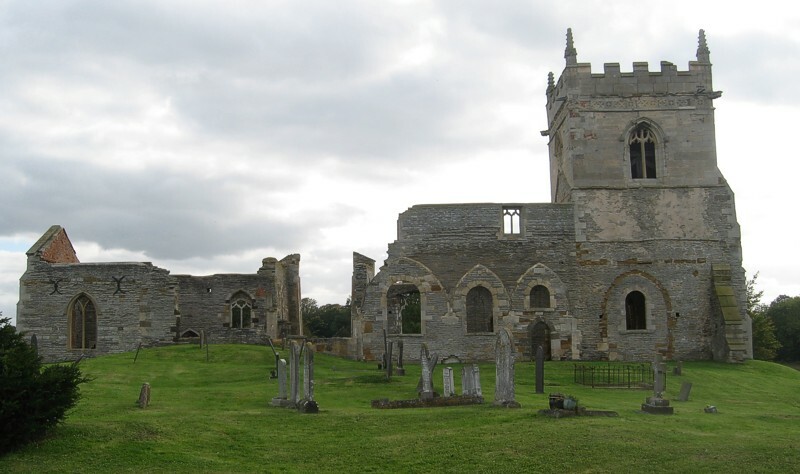 The depopulation of the Wolds led to decline and by 1744 the church was in disrepair. Permission was granted to demolish the north aisle, arcade and transept and south porch. In 1892 the Diocese allowed the interior fittings and roof to be removed after Robert M Knowles of Colston Bassett Hall built the new church of St John the Divine in the village. Two bells were transferred to the latter and the screen went to Long Whatton All Saints, Leicestershire. However St Mary’s was never de-consecrated. In July 2005 a service of re-dedication was held in the ruins following restoration work, which began in 1994 led by John Severn. It is a scheduled Ancient Monument and is listed Grade I.